Claimed as the most technically advanced and spacious fly-bridge yacht in the world. Progressive, capable, classically Princess. Bold aspirations,maybe? We at WSB have an opinion, so have taken a first look behind the claim before the P68 arrival at Southampton’s International Boat Show. The P68 will arrive and claim to rewrite the rule book on fly-bridge luxury, space and performance. Fitting into the Princess fly-bridge range, between the 64 and 72 Motor Yacht, the 68 promises the highest level of internal volume ever created by Princess for a given boat length, delivering four class leading cabins, a vast deck saloon, a fly-bridge and twin cockpits that will be the envy of many a 75ft vessel. But aside from the simple virtue of space, the P68 will also come packed with features, many of which are a first for a yacht of this size. Across the main deck level, a galley aft layout allows dining options inside and out, being perfectly placed to serve the cockpit. 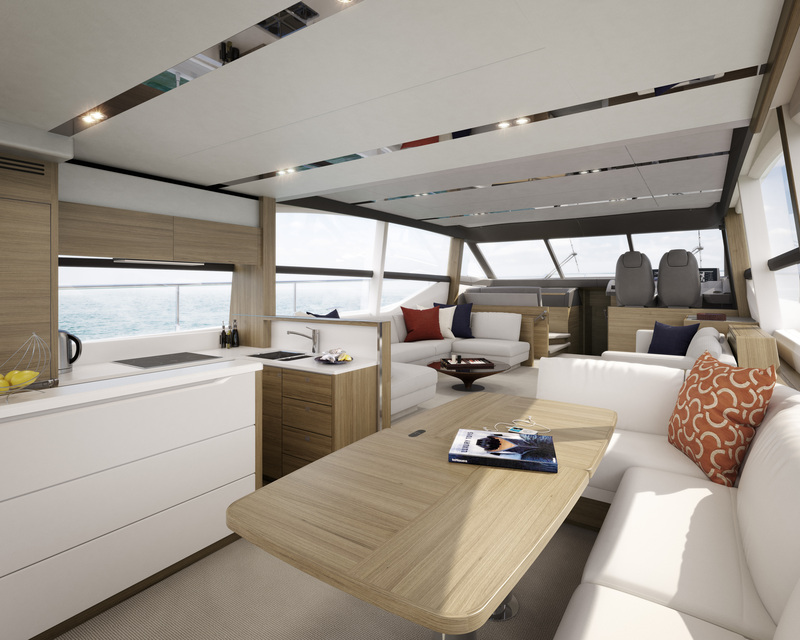 The synergy between interior and deck is further enhanced by an electric window that turns the aft galley counter-top into a serving bar for the cockpit. A small step up from the inside dining area, the deck saloon enjoys incredible views from the full height side windows, while ahead the helm position is joined by a raised L-shape seating to port, so friends and family can all be involved when underway. The 68’s master stateroom features a private stairwell and lobby, the guest cabins being accessed by a separate stairwell forward. This unique design creates a real sense of motor yacht sophistication for the owner as well as total privacy for those on-board. On deck, the aft cockpit is designed to be the main dining area and comes suitably dressed with mood lighting, beautifully upholstered seating for eight and a large teak table. After dinner you might choose to retreat to the bathing platform where an aft-facing twin seat is set into the transom. 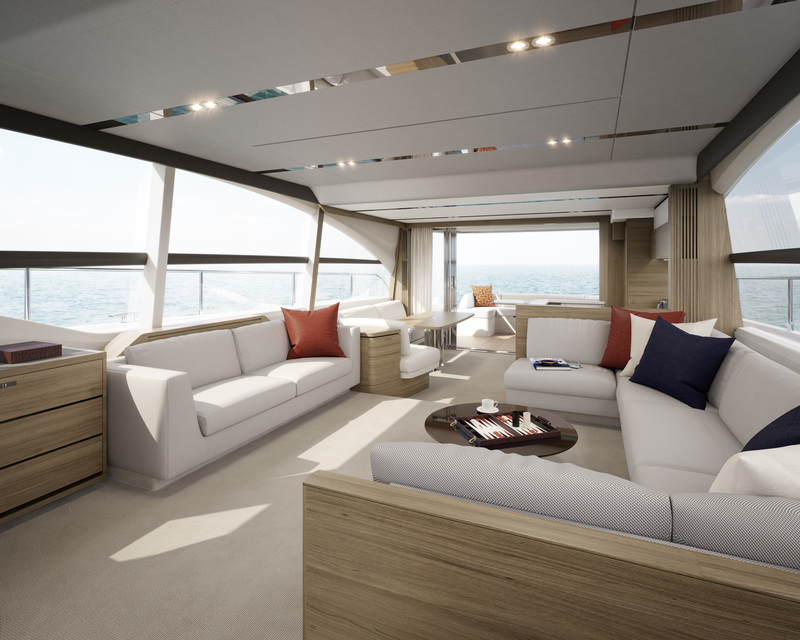 At the bow, a walk-through foredeck comes complete with an elegant seating area, large sun-pad and plenty of stowage. The flybridge above boasts vast sections of seating with the ability to seat five people across the helm area, a full wet-bar to keep everyone refreshed; and the added ability to convert the forward seating into a large sun-pad. Out at sea, the Princess 68 promises to deliver another classically refined driving experience with superb poise all the way up to a top speed in excess of 30 knots, with fast efficient cruising above 20 knots. The hull’s variable underwater geometry is designed to return smooth progress over the waves, the resin-infused composite build method creating a structure that is lightweight but immensely strong, allowing for greater fuel efficiency without sacrificing speed. The full beam owner’s stateroom is accessed from its own private stairwell running off the deck saloon. The stateroom includes a full en suite and dressing area with vast hull-side windows for the most dramatic views and a sofa to watch it all from in complete comfort. A stateroom lobby houses a washer/dryer with space for an additional dryer. 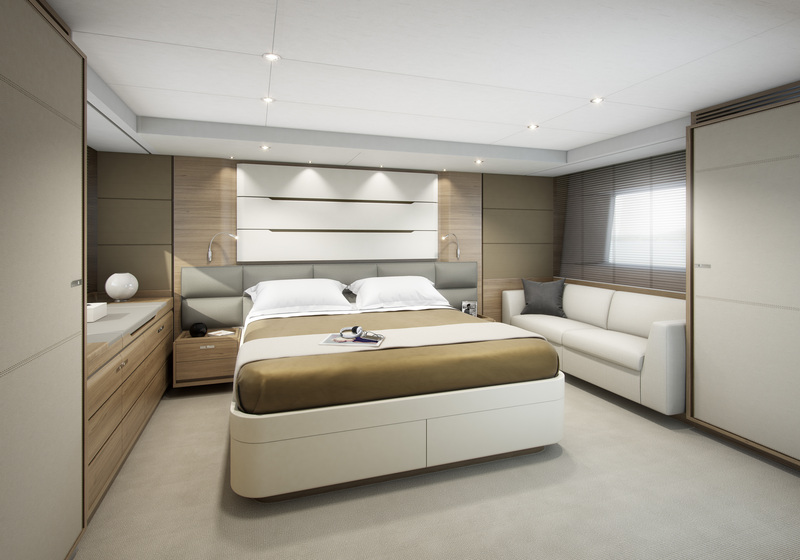 Guests will enjoy three further cabins, two en-suite, plus a generous crew quarters. The stairwell to the guest quarters hinges up to give access to a huge storage space, ideal for stowing luggage. Two separate seating areas are designed into the deck saloon with a further two areas on the vast fly-bridge which comes with the option of a hardtop with integral sunroof. A high specification aft cockpit comes with surround seating, speakers, bar access from the galley and a wonderful transom seat for the most magical evenings at anchor. The galley aft layout delivers some wonderfully flexible dining options with seating and tables opposite the galley and out in the cockpit. The galley’s aft window also opens up at the touch of a button to create a bar area for the cockpit. 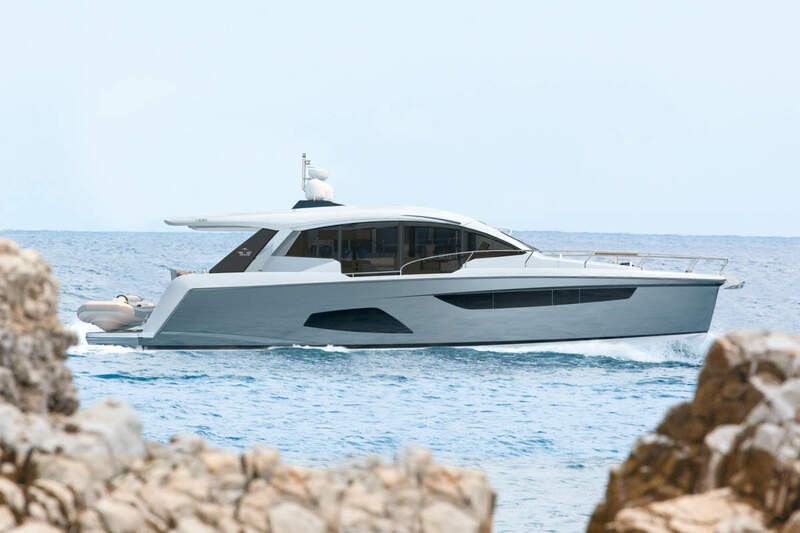 The 68 will feature a uniquely social and usable helm area, with the driving and navigation positions to starboard, and, at the same height, another L-shape guest area to port. The commanding helm position will also offer a door to the starboard side deck. The walk-through fore-deck has proved a massively popular feature with owners, offering a private retreat when in harbour or a thrilling vantage point when at sea. The 68 takes this innovative area and turns it into the most detailed fore-deck entertaining area yet with seating, sun-pads and huge storage lockers for all your day boating needs. Following our incredible developments in the use of glass, the 68 will include vast glass sections to the deck saloon, master cabin and forward VIP. In the master cabin alone the windows will measure over 1.6m2. The 68 will offer the highest level of internal volume per square foot of any Princess yet built. Fitted with twin diesel engines of up to 1400hp, speeds up to 32-34 knots are expected with fast efficient cruising in the mid-twenties.